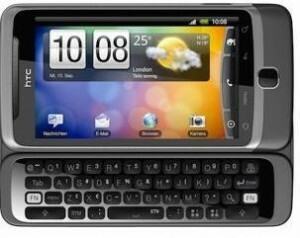 After yesterday’s release of a new set of Symbian 3 phones from Nokia World, HTC today scheduled a press conference in the same city and also at the same time. It was the London-based press conference where HTC announced two new much awaited Android handsets – the Desire HD and the Desire Z. The Desire HD has a 4.3 inch form factor and runs Android 2.2. The phone is powered with a 1 GHz 8255 Snapdragon processor. It seems like the Desire HD has similar features like the EVO which was launched for the GSM community. The phones will also have a 8-megapixel camera with dual-LED flash that let you record 720p video. The phones are also packed with Wi-Fi b/g/n, HSAP+ radio, and will also have the new enhanced version of HTC’s Sense UI. The Desire Z is all set to be the G2 and comes with 800 MHz Qualcomm MSM7230 processor, 3.7-inch display, and full-QWERTY keyboard. The new HTC Sense UI will work together with the new HTCSense.com and will leverage its services. The website will be live next month. Both the phones will be available in October along with the launch of the HTCsense.com.